Yeah yeah, so I only remembered to take the picture after I’d eaten half the burger. Sorry. The Five Guys craze has hit California full force in the last year, and I no longer have to go very far to get one of their burgers. Having been to the restaurant locations in Tempe and Atlanta in prior years, I am no newcomer to the Five Guys menu, and I typically order my burger the same way. I personally found that the first couple times I went to this location of Five Guys that the patty itself had little flavor and got lost amongst the other accoutrements of the whole package. This was not an issue I remembered having at the other locations I’d been to (Atlanta, Fremont, Pacific Beach, Pleasant Hill, Tempe, but really, who is counting). However, the Costa Verde (La Jolla) Five Guys is very new, and since then the burgers seem to have gained the flavor I am used to in a darn good cheeseburger. On this occasion, Katie and I stopped by to get our fix, and by the end of the meal, I was quite satisfied with my burger. I always get a regular order of fries. If you’ve never been to Five Guys before, you will soon learn that a “regular order” of fries is actually a gigantic cup of fries. That’s it, you say? Well, they also then throw in another cup full of fries into your bag. So a regular order of fries is really comparable to whatever the largest size McDonald’s offers. The fries are actually my favorite part of the meal (I like regular, not Cajun-style, personally), and they are actually what I look forward to most when I go to Five Guys. Burger and fries comes out to about $9.25. You get your money’s worth. Single-patty burgers are available, and the orders of fries are sharable with you and ten of your closest friends, if you’re looking for a cheaper deal. Now I have only been to the La Jolla Five Guys recently, so I do not know if this is a recent addition to all locations (will report when I am in the know), but the soda machine is this hi-tech gadget that is totally out of this world. I usually only order water when I go out to eat, but on this occasion Katie got a soda, so I got to see her use the machine. It uses a touch screen to choose your drink (and flavored syrups! ), and is very quick and clean. I wish I had a picture of it, but maybe they have been added to all locations and you all will know what I am talking about. In any event, it’s pretty darn cool. 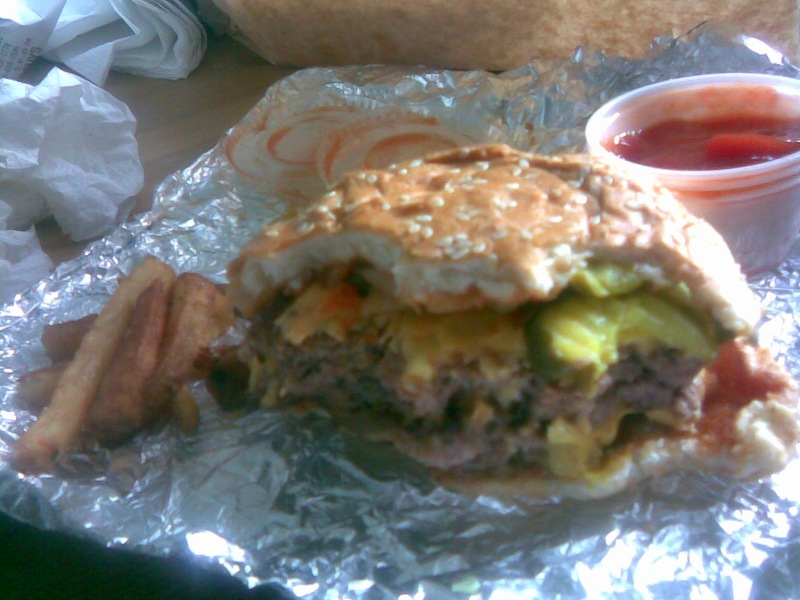 I still haven’t tried Five Guys Burgers and Fries, even though it rhymes!! !